So I've alluded to it in previous posts, but here is the announcement: I'M GOING TO SAN FRANCISCO THIS SUMMER! I have an internship this summer just north of San Francisco so I will be out there through August. I'm taking a cross country journey with my dad. 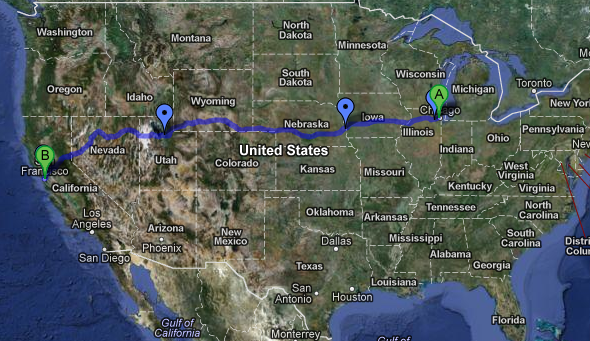 We will be going 2,100 mi and about 32 hours of total driving time. I'm excited to see parts of the West that I've never been too, especially Salt Lake. So what does this mean for the blog? I'm not completely sure yet. I will be living in a college dorm and therefore will not have access to a kitchen. I am planning on bringing some supplies (such as a blender, my mini food processor, ect.) so I will be doing some very primitive cooking, but my main focus will be on my job this summer. I love blogging though and I plan on having many new food adventures while I'm out there so my posts will shift to more food experiences. It's good to make a change. It will be a little more journal-like, but I think this concept for the summer will work well. I'm adding a new tab called "Recommendations" which I will be in the process of updating throughout the next month. I'll be sure to post about the restaurants, food, and wine out in Northern California (I'm especially excited about Napa). What does my summer hold? Hopefully a lot of learning, meeting new people, and trying new things. Stay tuned as I let you know about my next great adventure! Check my Facebook page for more updates in the future.